THE accepted wisdom is that dance careers are brutally short and in many – probably most – cases they are. The performers who break that barrier should be cherished. They may not have the effortless flexibility and super-human extensions they once had, but since when did elasticity equal artistry? Indeed, there is much discussion in classical circles these days about the great danger of tricks – endless turns, legs behind ears, gymnastics in the air – trumping emotional engagement, expressiveness, imagination and the use of the body as an infinitely varied instrument of meaning. In Australia there are few opportunities for older dance artists; certainly no regular ones I can bring to mind, except for the collaborations between sculptor Ken Unsworth and Australian Dance Artists. Performances have taken place at the Art Gallery of NSW and Cockatoo Island, but latterly they have been at Unsworth’s Sydney studio, in which he manages a quite remarkable array of effects. The invited audience sits on hard pews, the stage machinery shudders and groans a bit and there isn’t the seamless transition from scene to scene one sees in the subsidised and commercial sectors, and yet there is an inordinate amount of magic. Imagination, emotional engagement – that’s what you get. Australian Dance Artists was founded by Norman Hall, who collaborates on choreography with the four current ADA dancers – former London Contemporary Dance Theatre artists Anca Frankenhaeuser and Patrick Harding-Irmer and Sydney Dance Company alumni Susan Barling and Ross Philip. Their collective experience is immense, but would be of academic interest if they were not, all of them, still exceptionally potent performers. For The Arrangement Unsworth – he finances these productions entirely – really pushed the boat out, commissioning music from Jonathan Cooper and engaging The Song Company to sing texts by A.E. Houseman, Federico Garcia Lorca, W.H. Auden, Barnabe Googe and Rainer Maria Rilke. The Song Company’s long-serving artistic director, Roland Peelman, was at the helm (and the piano). Unsworth may be in his ninth decade but has lost none of his zest for the complexities of human existence, often casting an absurdist eye on events. He made a cameo appearance at the beginning to usher in a series of stage pictures connected not by any narrative but by themes of love, longing, the passage of time and the cycle of life. Unsworth paid no attention to the potential limitations of his studio, making alterations and engaging a production team that enabled a woman (soprano Susannah Lawergren) to rise and descend through floor and ceiling; to allow Frankenhaeuser appear to levitate in ghostly fashion; and to have The Song Company singers revolve as they stood like mannequins while Philip assembled a real – i.e., not living – mannequin into a decidedly non-traditional form. One of the most memorable dance moments came when Harding-Irmer, balancing on a ball, absorbed energy from Frankenhaeuser, whose flickering hands were the very embodiment of electricity. Harding-Irmer and Frankenhaeuser, partners in real life, appeared to be the more connected pair while Barling and Philip were tougher customers, but central to all the movement was a sense of personal history drawn upon. These people had pasts, stories and secrets. Cooper’s vivid, theatrical music was in expert hands. The Song Company’s Lawergren, Clive Birch (bass), Richard Black (tenor), Mark Donnelly (baritone), Anna Fraser (soprano) and Hannah Fraser (alto) were not only singers of the highest order but game participants in much of the action. Also under Peelman’s direction were the fine musicians Ollie Miller (cello), Lamorna Nightingale (flute) and Jason Noble (clarinet). Unsworth created a world that was sometimes dreamy, sometimes nightmarish, always surprising. It was a privilege to be there. Reginald Theatre, Seymour Centre, June 20. RUTHLESS! The Musical could with much accuracy be called Shameless! As it charts the incident-packed life of a stage-obsessed tyke and her perhaps not so ordinary Mom, Ruthless! cheerfully plunders Gypsy and All About Eve for characters and motivations and pays homage to any number of Broadway shows, including of course the most aspirational of them all, A Chorus Line. Which means, of course, if you don’t know your Broadway from your Brecht you may be rather at sea in a show that exists only to send up an unhealthy hunger for fame. I was going to say it satirises the pursuit of the spotlight, but that would be giving Ruthless!, written in 1992 by Joel Paley (book and lyrics) and Marvin Laird (music), a bit too much credit. 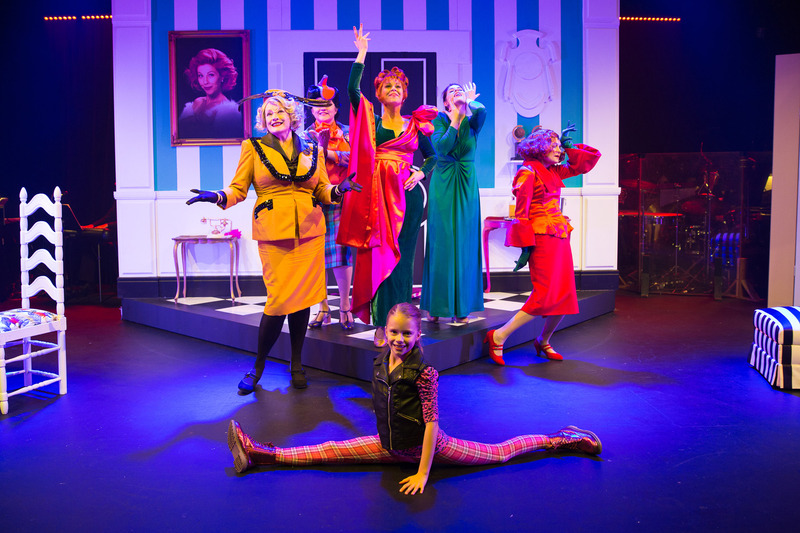 It’s a fun, bubbly cartoon given a terrific production by a newish Sydney company called The Theatre Division and best enjoyed with a drink in your hand and a show tune in your heart. Tina Denmark (on opening night Madison Russo, who shares the role with Jade Gillis) is an all-singing, all-dancing pint-sized bundle of ambition who is devastated when she fails to win the leading role in her school musical, Pippi in Tahiti. Look out Louise Lerman (Caitlin Berry), the less talented but much better connected student who gets the part. Also in the mix are the mysterious Sylvia St Croix (Meredith O’Reilly), who is also desperate to see Tina get to the top; third-grade teacher Miss Block (Margi de Ferranti); the poisonous theatre critic and grandmother to Tina, Lita Encore (Geraldine Turner); and Tina’s mother Judy (Katrina Retallick), who undergoes a dazzling transformation during interval. The camp-o-meter is turned up to 15 and the stage set for revelations that are flagged as obviously as a Panamanian ship of convenience. Obviously there’s only way to sell this material, and that’s to go big, or preferably bigger. Director Lisa Freshwater has assembled just the cast to do that, with Retallick proving yet again that she’s a sparkling comedienne. The Sydney Theatre Award she won this year for Dirty Rotten Scoundrels (speaking of shameless, that was a plug for awards in which I am involved) was no fluke. Turner gives a star’s turn as the bitchy journalist and young Russo is ridiculously talented and apparently knows no fear. But everyone is terrific, as are Mason Browne’s amusing and cleverly conceived set and costume designs and Neil Grigg’s splendid hats. The sound balance seemed a bit out of whack to start with on Friday night but either it or my ears settled down, enabling better appreciation of the small band under Brad Miller’s musical direction. In truth Ruthless! runs out of steam towards the end of a not very long show, but the attractive exuberance of cast and production gets it across the line. Ruthless! runs until July 5. I AM currently in New York seeing a LOT of shows. My diary page will be updated regularly. Back mid-February.